Police in West Yorkshire have cracked what they say was a major drugs smuggling ring. Three men have been convicted at Bradford Crown Court, two for smuggling and one for money laundering. The story began for me on a back street in Glasgow outside a down-at-heel Indian restaurant. We had travelled to Glasgow on the hunt for bogus colleges - regularly used by foreigners as a way to enter the country illegally by posing as students. Such colleges range from complete shams where no teaching takes place at all, to colleges with teachers and students, but which often have hundreds more students registered and paying fees than ever actually turn up for classes. Yorkshire College appeared to fall into the second category. It was June 2008, and a number of bogus colleges had recently been closed down by the authorities in Glasgow. The BBC had received information that some officials from Yorkshire College, based in Bradford, were moving in to fill the void. The college management had arranged to hold an "open day" in Glasgow for prospective students at a new college they were planning to open in the city. I had been in touch with a college administrator on the phone and perhaps surprisingly had been invited to attend the open day. However when we arrived there, it rapidly became clear that this was no ordinary event. For one thing it was being held in an Indian restaurant, rather than the college buildings. Secondly there were no prospective students there. We met Mohammed Faisal, the principal of Yorkshire College, along with several of his colleagues in the restaurant, and listened to him talk about his plans for expansion into Glasgow. But where were the students? After a long, embarrassing wait, still no students had arrived and our welcome was wearing thin. The previously agreed offer to record an interview was withdrawn, and we got the distinct impression that it was time for us to leave. It all seemed very fishy, but we had no clear evidence of wrongdoing, and I was beginning to wonder if it was turning into a wild goose chase. But then we had a lucky break. I talked to West Yorkshire Police, who were alarmed - to say the least - that I was asking questions about Yorkshire College. It turned out that some of the people we had just met in Glasgow were about to be arrested, but not for immigration crime. Instead it was for something more serious. According to the police they were prime suspects in a major heroin smuggling operation. A few days later, early in the morning, we arrived in Bradford with a large number of officers from West Yorkshire Police. Simultaneous raids were taking place at a number of addresses in Bradford. We accompanied police officers as they arrived at the home of Mohammed Faisal. A short time later he was led out of the house in handcuffs, looking very surprised to see the BBC again. Later at the headquarters of Yorkshire College in Bradford, the police began to search the building. A small number of students and staff members were there when the police arrived. None of them had any idea that the college was anything other than what it appeared to be - a small, somewhat scruffy college for foreign students. We spoke to one of the lecturers, Kenneth Norbury, who taught business studies, and broke the news to him that his boss and others had been arrested for heroin smuggling. "I'm shocked at that," he said. "It's wrong and I don't condone it. I can't imagine anything like that happening here. I'm really shocked at that and in fact I'm very annoyed. "I wouldn't be surprised if they'd been cutting a few corners here, but certainly not to be involved in criminality to the extent of drugs supply." The college comprised a few class rooms, a library, and a computer room. The majority of the students there came from Pakistan and were studying courses in business studies. There did not appear to be facilities for more than a few dozen students, but as police officers rifled through the paperwork at the college it became clear that hundreds of students were registered as attending. The government says it is now clamping down on bogus colleges. Under new regulations colleges must get a licence from the UK Border Agency (UKBA) to sponsor student visas and must verify that students are actually attending courses. This week the Commons home affairs select committee was told that abuse of the immigration system by bogus colleges amounted to a "national scandal". The Immigration Minister Phil Woolas has described fake colleges as the "Achilles heel" of Britain's border controls. UKBA says it is now vetting all colleges and has reduced the numbers allowed to bring in foreign students from 4,000 to 1,600. Following the arrests and searches in West Yorkshire, police began to piece together the extent of the conspiracy being run from Yorkshire College. 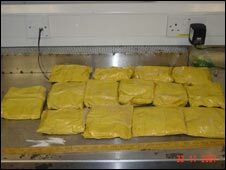 Parcels containing 13 kg of high grade heroin worth £650,000 were seized by customs officers. They were being sent through the post from Pakistan to a number of addresses in Bradford controlled by the gang. The drugs were concealed in bundles of clothing. In some parcels, packets of heroin were sewn into the lining of jackets. Another 7 kg of heroin was also seized in Pakistan. 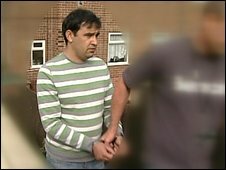 However it became clear from an analysis of the financial records of Yorkshire College and a Bradford money exchange business, controlled by two of the conspirators Ali Ifthikar and Roohul Amin, who also helped run Yorkshire College, that the men did successfully profit from large amounts of heroin which did make it into the country and out onto the streets. Around £1.2m in profits from drug dealing was laundered through the money exchange business. The money was sent to co-conspirators in Peshawar, in Pakistan's troubled north-west frontier province, and has not been traced. The fear is that some of the money could help prolong the fighting between the Pakistani army and the Taliban. Tracing the money has proved almost impossible for the police because of the "hawala" system of money transfer used by the gang. Hawala is an ancient system based on trust and commonly used throughout Asia. It enables money to move from one country to another without the usual audit trail relied on by money laundering investigators. While the system is legitimately used by millions of migrant workers all over the world to send money to relatives at home, it is also a practice that is wide open to abuse by criminals. Experts say it can be an almost foolproof way of moving the proceeds of crime abroad. "No money actually has to physically move anywhere," says Misha Glenny, author of McMafia - a book investigating organised crime. "You walk into a hawala broker in London or Bradford or wherever. You hand over the money. He then signals to his partner hawala in Pakistan that this money has come in and someone is going to come and pick it up. "So someone comes in, picks up the money, and at some point the two hawala operators balance their books together. But they never have to physically shift money from one country to another. And that's the great advantage." Two men - Mohammed Faisal and Roohul Amin - have now been convicted at Bradford Crown Court of drug dealing and money laundering. They and another, Ali Ifthikar, were also found guilty of money laundering. A fourth man was acquitted of all charges. Other members of the gang have managed to escape justice by fleeing overseas - probably to Pakistan. The money has also gone, with no hope of ever recovering it.